Well, after my third attempt, I did it, I was finally able to satisfy my kimchi craving. Not with me? Okay. I’ll back up. To back up, I’ll go back to last night. After work last night, the dinner plan was decided. I was going to pick up dinner at Asian Express. The food was called in so I just had to pay for it and pick it up. When I picked up my dinner, the disappointing news was broke to me. They were out of kimchi. The cashier reassured me that there would be more during lunch tomorrow. Okay. During lunch? I can do that. So taking her at her word, I came in, about a half hour after opening. Right before lunch. I sat down at a table, grinning from ear to ear. I was about to sink my teeth into some delicious kimchi. So I ordered it and a few minutes passed. The cashier then returned. HUWHAT? Okay. Now I was feeling a little uneasy. Tonight? “What time?” I asked. Strike two. At this point, I was on a kimchi mission. It was kimchi or bust. I left the restaurant and the wait began. Hours later, I returned after picking up some groceries. I sit down and ask for a large kimchi. The kitchen comes out and plops down a heaping bowl of kimchi. 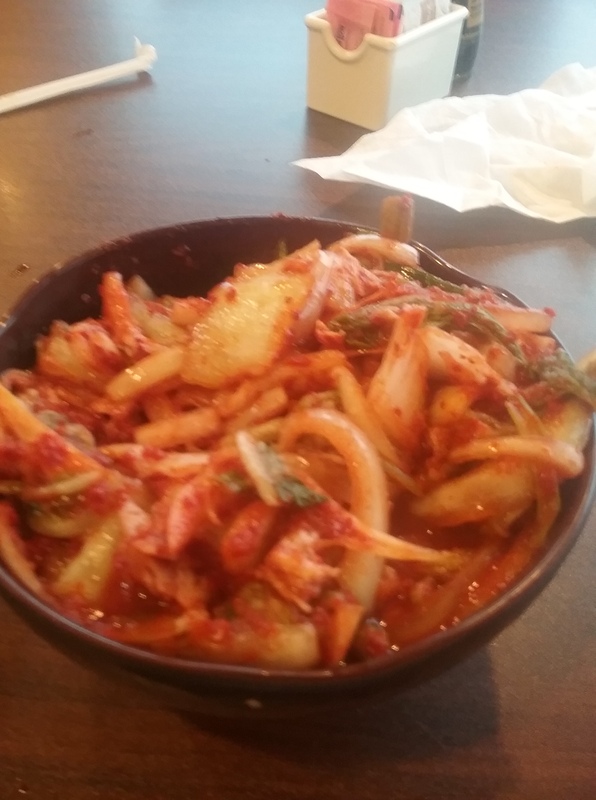 Now there was a LOT of kimchi in that bowl. From that picture that I took, it was after I already put a good dent in it. There was so much kimchi that I had to take the rest home. Mission complete! With my kimchi story having a happy ending, I will now switch into Christmas mode. Time to enjoy some Christmas videos on YouTube! Today’s high is going to be 36 degrees and the silver lining is getting my kimchi fix today. To those of you who love fermented cabbage, I hope that you all have a fantastic day. Muse: Kimchi? You have kimchi? Tee hee! I want some! You better watch your leftovers because they’re about to be gone!